Staff was great and so helpful. Wonderful stay and we will be back when the hotel is complete! Location is perfect! Food was tasty, in room massage was heaven! - Staff are amazing and extra helpful! - Rooms are nice and clean with an edgy and minimalistic design. - Private pool is nice and clean. - Location is excellent! Just far enough from all the night life to stay quiet yet close enough to enjoy getting around on foot. - Canggu is a beautiful place, I like it more than Kuta, it's a bit more spacious and laid back than Kuta and everything a tourist would need is only a walk away. Everything was good, clean, nice, breakfast was good. The facilities provided was really good. The pool was really comfy. This is absolutely stunning property! The rooms are two level with a nice shower on each floor. Pool right in front of your room entrance made me feel immediately at ease. The front desk staff is super helpful and it's nice to chat with them via WhatsApp! So convenient! And of course having coffee every morning at Coffee & Coconuts was lovely By the way wifi here is the best! Everything was just perfect! Loved the staff, very friendly and helped us with everything and made our stay just perfect! The rooms were much better than we excpected, very comfy and spacious, bed was very comfortable, rooms were very clean, cleaners every morning. We stayed in villa with private pool and the pool was amazing! Many plants, hammock and basketchair made it beautiful! Style of the room was modern mixed with classic! They are still building the place so i do excpect it to be even better! Also the restaurant was very good! Healthy delicious food with products from local farmers and and super friendly staff! The sea was just 50 meters from the hotel! Although the beach is not perfect for swimming its perfect for surfing and popular places like the old mans and the lawn is 5 minuts walk away! Not one bad thing to say about the place, its amazing and i deffinitely recommend to stay there! Everything was amazing. The staff were the most friendly and helpful staff at a hotel I have ever come across, always willing to go above and beyond to help you up. The room was luxurious and beautiful and serviced twice daily. The food delivered to the room in no time at all was wonderful. Can’t wait to come back. Our stay at the Zin Canggu exceeded all expectations. The room was beautiful, very spacious with high ceilings, a small lounge area and a large bathroom with a great shower. We loved having the swimming pool right outside, which was great for cooling off during the afternoon and hanging out. The location is also unbeatable. It's right where you want to be in Canggu. The best thing about the Zin though has to be the staff. I have never come across a friendlier, more hard-working group of people in my travels. Everyone is constantly smiling at you, eager to make your stay as awesome as possible. An example of this: having checked out, we were in the car being driven away to Ubud when we hear a scooter honking at us from outside. Our driver pulls over and one of the cleaners from the room runs over to the car and hands us over a bag with swimming trunks and some small items that we had forgotten in the room. Classic Zin! All in all, the Zin is great. Stay there! The staff were amazing - so friendly & welcoming. The villa itself was really well decorated and had a cool vibe. Loved the over-water hammock! Lock in a great price for ZIN Canggu – rated 9.4 by recent guests! 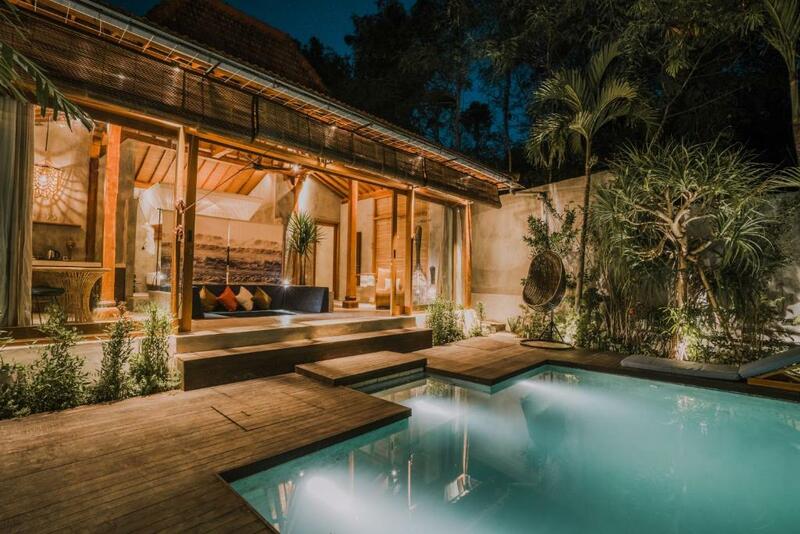 ZIN Canggu This rating is a reflection of how the property compares to the industry standard when it comes to price, facilities and services available. It's based on a self-evaluation by the property. Use this rating to help choose your stay! One of our top picks in Canggu.Located within 1.4 miles of Echo Beach and 2.4 miles of Vue Beach Club in Canggu, ZIN Canggu has accommodations with free WiFi. Offering a terrace, some units are air-conditioned and have a dining area and a seating area with a cable flat-screen TV. A continental breakfast is served at the property. There's an in-house restaurant, which serves a variety of American dishes and also offers vegan, dairy-free and gluten-free options. Guests at ZIN Canggu can enjoy cycling nearby, or make the most of the garden. La Laguna Bali is 2.7 miles from the accommodation, while Batu Bolong Beach is a 12-minute walk away. The nearest airport is Ngurah Rai International Airport, 11 miles from the property. 뀐 Located in the top-rated area in Canggu, this property has an excellent location score of 9.2! When would you like to stay at ZIN Canggu? 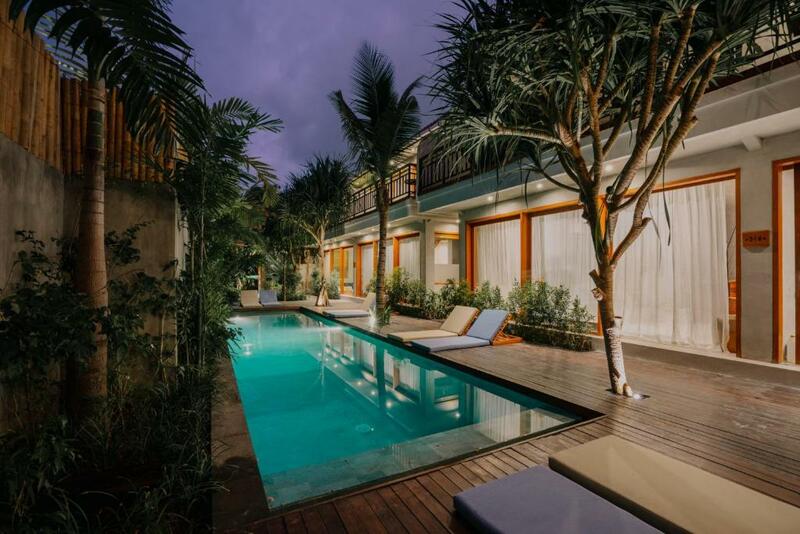 Brand New Boutique Resort soft-opened in August 2018, located in Canggu Nelayan. This incredibly beautiful resort features 12 spacious units with 16 rooms in total. Just 100 meters to famous Canggu beach. Style and comfort at its best blended with famous Balinese hospitality. All rooms come with AC, mosquito net, ceiling fan, Bar&Fridge, Flat screen, free WiFi, the free use of a mobile phone – your personal digital assistant (free international calls, internet and helpful tips). Check out our services and facilities below, that we crafted and designed to make your stay unforgettable. ZIN Hotel Canggu is located for those who want to feel the new atmosphere in centre of Canggu. This property is 1 minute walk to Nelayan beach. The property will have full facilities of private villas, rooms, restaurant with rooftop, gym, spa, and shops. House Rules ZIN Canggu takes special requests – add in the next step! All children under 2 years are charged IDR 300000 per night in a crib. ZIN Canggu accepts these cards and reserves the right to temporarily hold an amount prior to arrival. Good Location! Excellent staff spec herando and Mo !! Beautiful villa and location. Staff helpful and friendly. When we arrived we were informed there may be noise from the nightclub next door. This was a litttle disappointing and we asked if we could be moved to another room. Staff were helpful and in the end we didn’t hear any music at all. ZIN cafe breakfast was delicious and would eat there again. ZIN was perfect in every way. We stayed for 8 nights & our family of four loved its pool, it’s location, the staff & having the ZIN cafe next door was such a treat. The stair to the second floor. It looks cool but was hard to handle for our youngest child. And even for us adults in the middle of the night. Comfy beds. Stylish rooms. Excellent breakfast at the restaurant. Staff was super friendly and helped us before we even knew we would need help. Jaya gave us the best service and the room was always clean. Our kids enjoyed the pool alot! Rather far away from touristy area and free shuttle service would be great! Slightly noisy at night but the hotel did inform us. Overall still a good experience. Huge room with private pool. Wifi is good. Aircon was cold. Service was excellent. And the cafe was very chic and serve decent coffee and food. - Rooms have no phones. In order to communicate with the staff you have to either use WhatsApp or go out of your room to talk to them. It's a minor inconvenience. - Rooms have an open concept, so the front door doesn't seal properly and insects and geckos can easily get in. My room had a gecko in its ceiling which was a little noisy at night but we slept just fine. I wouldn't let those two things stop me or anyone from visiting ZIN, I'd still go back in a heartbeat. All was practically faultless until we had to check out. We asked for them to order us a large taxi to the airport and to bring one suitcase down the very steep and confusing stairs - the concierge on duty spoke very little English and ended up calling the hotel owner (we presume) who simply wished us a safe trip instead of helping. They then ordered a small taxi which would only take 2 of the 3 of the group so we had to send the driver away. We managed to organise a Grab (Uber) ourselves that could take all passengers and suitcases in one trip. After about half an hour the taxi man was still sitting waiting demanding money and harrasing us and the Grab had arrived and they still hadn’t moved the suitcase and were faffing about with paper and allowing the taxi driver to follow us. The taxi driver then began screaming at us saying ‘DON’T COME BACK TO BALI YOU F*UCKING C*UNTS!’ and was being very aggresive to which they did not intervene. Unfortunately this tainted our stay and left us disappointed as the service prior was exceptional. The majority of staff were fantastic. Despite being a soft opening the facilities, rooms and services were really good. Location near the beach and bars and we were pre warned about local music and offered earplugs if needed. The staff cleaned very thoroughly and even cleaned pur sandy shoes for us!